When your laptop is connected to the Internet all the time, especially at the office, you probably have your e-mail program configured to check for new messages every so often. On a laptop with a dial-up connection, however, that may mean that you’re faced with a sudden panic as you realize that your computer is once again dialing out of the hotel during peak hours to pick up new e-mail. In the Options dialog box, click the General tab (if needed). Uncheck the Check for New Messages Every [blank] Minutes check box. (Optionally) From the If My Computer Is Not Connected at This Time drop-down list, choose Do Not Connect. Setting this option ensures that merely starting your e-mail program doesn’t cause it to try to dial in to the Internet. Deselect the check box by the option Send and Receive Messages at Startup. This step is optional but recommended. 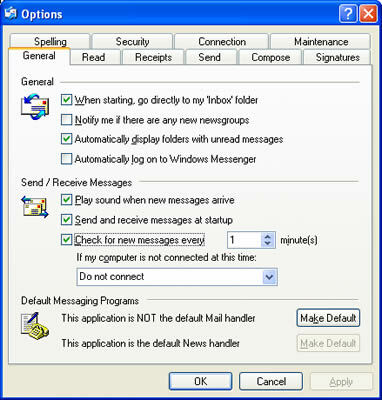 The setting prevents Outlook Express from immediately contacting the Internet when you first start the program. That way, you can read pending messages and then connect with the Internet when you’re ready. To connect with the Internet and send or receive messages, click the Send/Recv button, or use the keyboard shortcut Ctrl+M. Remember that making these settings only saves you time and battery power when you use the dial-up modem to retrieve your e-mail.